Standard Hexagon shaped nut. Available in zinc plating, hot dipped galvanized, and 18-8 stainless steel. Heavier than regular hex nuts. Available in zinc, hot dipped galvanized, or plain finishes. Also available in 2H plain finish and hot dipped galvanized for A325 structural bolts. Also called 2 way, all metal, or center lock. Use with higher grade bolts. Good for high temperature applications. All metal lock nut, used in higher temperature applications. Use with higher grade bolts. Only available in Zinc plated, which cannot be used with galvanized bolts. Hex Jam Nuts are thinner than regular hex nuts. Only available in Zinc plated, which cannot be used with galvanized bolts. A nut with an attached free spinning external tooth lock washer. 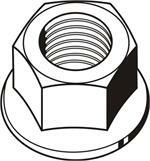 Also called a K Nut or Washer Nut. Only available in Zinc Plated. Hex flange nuts have a built in washer face that is serrated to prevent loosening due to vibration. Flange nuts cannot be used with galvanized bolts. A nut that can be turned by hand. Only available in Zinc plated, which cannot be used with galvanized bolts. Cap nuts have a finished dome shaped top that covers the end of the bolt. Bolt length must be exact. Only available in nickel plated steel. T-Nuts are used to create internal machine threads in wood by lodging the barrel into an existing hole. The prongs lock it into the surface of the wood.